French people are voting in local elections in which Marine Le Pen’s far-right National Front party (FN) is expected to score big gains. Sunday’s first round will be followed a second in a week’s time. Polls suggest that the Socialists of President Francois Hollande will suffer another setback, after defeats in municipal and EU elections last year. The Socialists and the centre-right UMP have been joined by the FN, not as a freakish upstart but a serious contender for power. The FN has benefited from economic stagnation, high unemployment, and general hostility to mainstream parties. The governing Socialists and their left-wing allies are expected to take the biggest hit, losing many of the 61 departments they hold. 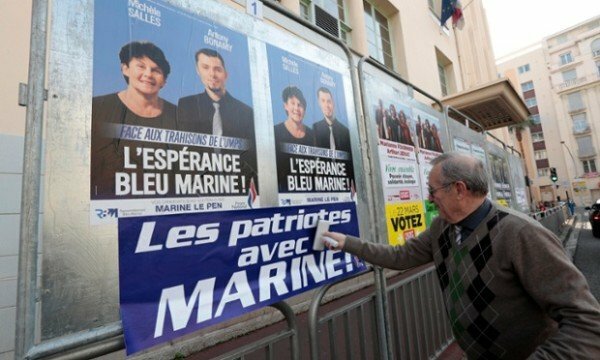 The FN is also taking voters from the UMP, which has struggled to unify behind a single leader since the defeat of Nicolas Sarkozy in the 2012 presidential election.